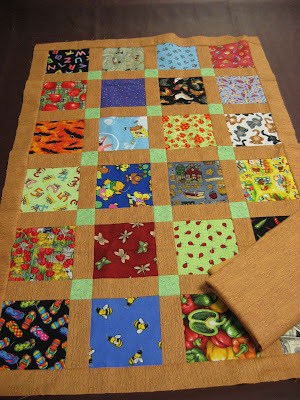 Hooked on Needles: Piece 'I Spy' Quilt Tops ~ Check! Don't you love checking items off your to-do list? I sure do! One of the things I wanted to accomplish this summer was to use up the 120 I Spy charm squares I received in Karen's I Spy Block Swap last year. 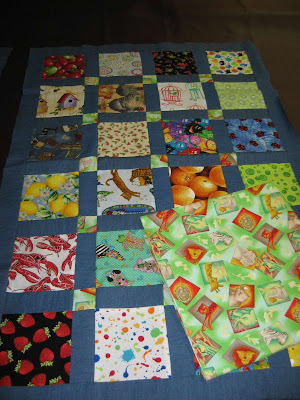 The first quilt, this boy's quilt with fun striped binding, was completed and is now in my Etsy shop, and now I can happily announce that I have completed the other four quilt tops and have even cut the backing for each one! Here's the pile, all colorful and fun! Ooooh, I didn't realize how blurry this picture is until just as I'm writing this! Sorry about that. 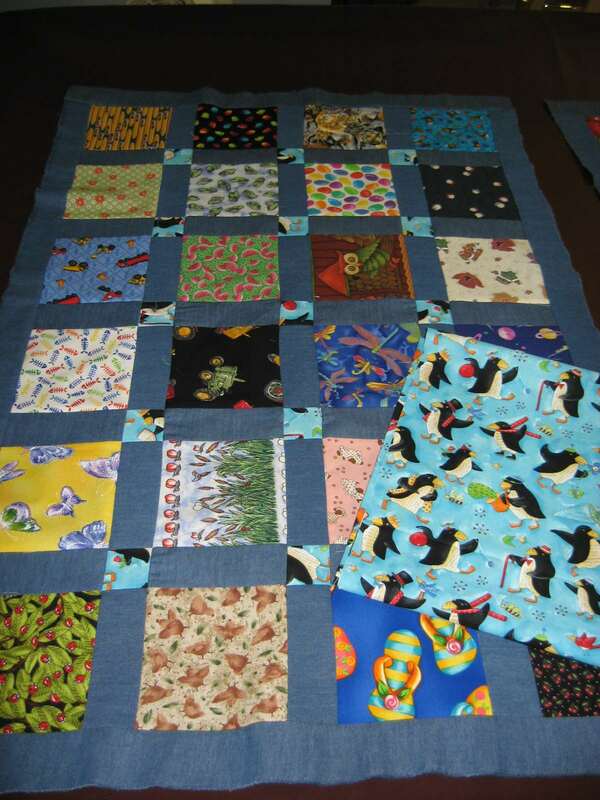 Anyway, you can see the backing fabric folded up on the side with all those fun penguins on it. This is the same fabric that I used for the little squares in the denim sashing. 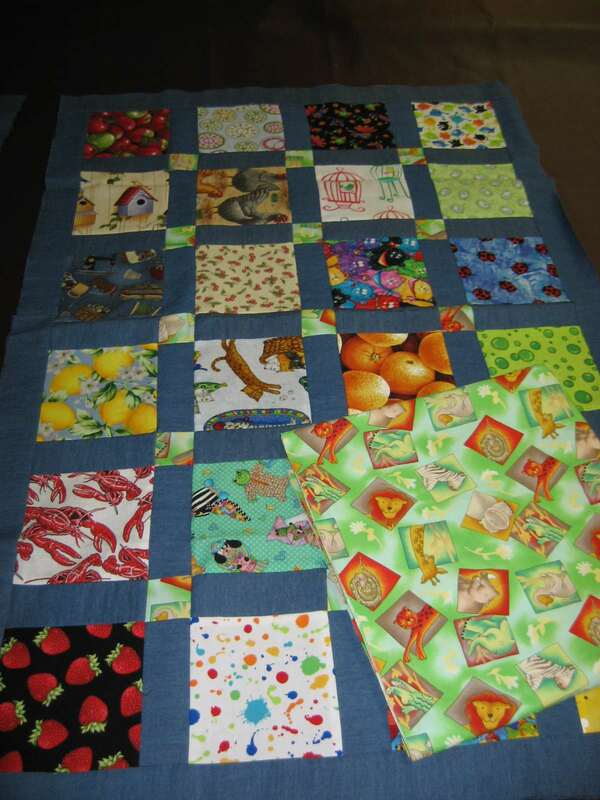 Here's another one that got denim sashing, and the little squares are made with that bright animal print that will also be used for the backing. 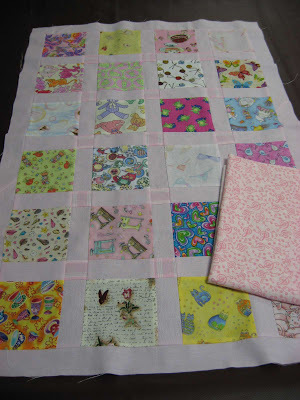 Here's the pretty pink girly quilt top, with soft pink oxford cloth sashing and barely darker pink squares with little white lines in between. The backing fabric has pink music notes all over it. This fourth quilt top has wood grain fabric as the sashing and backing, with green leaf fabric for the little squares in between. 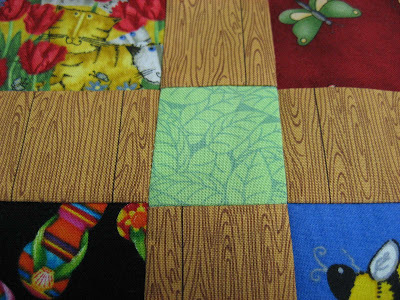 The leaf fabric will also be used for the binding on this one. So that's another project to check off my list for this summer. Whew! 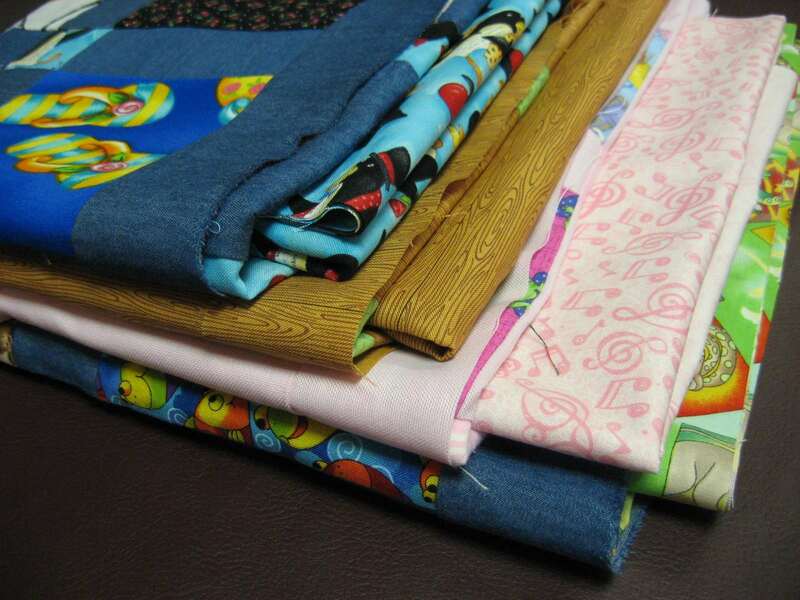 I am hoping to long arm quilt these four myself, but I must wait until my favorite long arm quilter has time to teach me how to use her machine. Then I'll have to find time to actually use it and get these done! School is starting again soon and this will be the first year that all three of my children will be in school (college sophomore, 2nd grade and Kindergarten! ), so I should be able to find time for this and other things on my list as well. We'll see! Oh the pink~ the pink! I adore the pink! Wonderful I spy quilts. 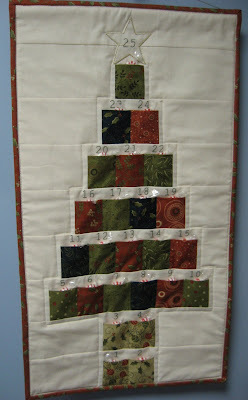 Lovely way to use cute novelty fabrics! Love your quilt tops. I had to smile when I read the ages of your children. Our two are almost twelve years apart. It was almost like raising two only children - interesting and enjoyable. When our daughter was real little, she would tell her friends that she had a brother in college and that he was "real old"!! 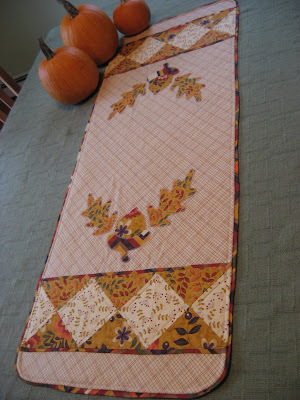 The quilt tops are great!